Do I need to clean my Oceanus 1? Yes, you should clean your Oceanus 1 completely between each crop. There are several cleaning solutions available in the market, just ask your local dealer. You can also use a few drops of antibacterial handsoap to clean the Oceanus 1. Just make sure you thoroughly rinse (minimum of 3 times) the Oceanus 1 to remove all soap and debris before using. Is there some way I can test my Oceanus 1 to make sure it's functioning properly? Place the Oceanus 1 on its backside with the 24 hour clock facing up. Position both floats in the 'UP' position, "towards the black lid". Plug the 120 volt night light or 120 volt circuit tester into the "DRAIN" side (right side of the clock) of the Oceanus 1 controller. Turn the 24 hour clock dial to function in the "DRAIN" cycle (white arrow pointing to the black part of the dial). Plug the Oceanus 1 into a 120 volt source, and the night light/tester will illuminate. Push the "TOP" float that is closest to the lid towards the bottom of the bucket and wait five (5) seconds then push the "LOWER" float towards the bottom of the bucket wait five (5) seconds and the light/tester will turn off. Unplug the Oceanus 1 from the 120 volt source and move the light/tester from the "DRAIN" side to the "FILL" side (left side of clock) of the Oceanus 1. Place both the "TOP" and "LOWER'"floats in the down position "towards the bottom of the Oceanus 1". Turn the 24 hour clock dial to function in the "FILL'"cycle (white arrow pointing at the orange part of the dial). Then plug the Oceanus 1 into the 120 volt source and the night light/tester will illuminate. Push the "LOWER" float of the Oceanus 1 towards the top of the of the bucket wait five (5) seconds and push the "TOP" float towards the lid and wait five (5) seconds and the light/tester will turn off. To verify that the timer is working properly, plug a fan or test light into the DRAIN side and have both floats in the UP position and the arrow on the timer pointing towards the orange FILL ring (trippers are pushed to the inside of the timer). Then allow the timer to operate (do not touch clock dial) on its own. When the timer goes into the DRAIN function (trippers are pushed to the outside covering the orange ring) the fan or test light will be ON. This test verifys that the timer is operating properly. 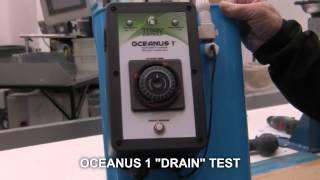 If the Oceanus 1 has functioned as specified above, then it is working properly. If for some reason the Oceanus 1 functions differently then above, please call the Titan Controls hotline- toll free at 888.808.4826 and we'll be happy to help you out.! My float switches in my Oceanus 1 are not working and my system is not filling and draining properly. What can I do? The float switches, as well as your Gro System need to be cleaned regularly, preferably between every crop. As you can see in the picture below, the float switch on the LEFT is new. The float switch on the RIGHT has been through several crops, is covered in nutrients and was returned by the customer because, "their system wasn''t working right". An easy cleaning method is to soak the float switch in white vinegar for a half hour or so, then take a soft brush (like a toothbrush) and gently scrub off the nutrient materials. Rinse the float switch with clean water prior to re-installing into the Oceanus 1 controller. When re-installing the float switch, make sure the thick/fat side is pointed towards the bottom of the Oceanus 1/Oceanus 2.